Kevin Barry Moore was born on 23 May 1955 to Nancy Power and Andy Moore of Newbridge in County Kildare, Ireland. He is the youngest member of the family and has three sisters and two brothers. Barry was educated by the Patrician Brothers in Primary School and by the Dominican Fathers in Newbridge College. He formed a group with his brother Andy and best friend Pat Kilbride - Aes Triplex - while in Newbridge College. He went to College in Limerick where he studied Russian and European Studies. He dropped out after a couple of years in order to concentrate on his music. Music was an intrinsic part of his life growing up. All of the family sing and play, but Barry had his own way and style of making music. From a very early age he was writing songs and honing his skills as a serious guitar player. He first went on tour as the support act to his eldest brother, Christy Moore, in 1969. This was a tour of English folk clubs. He was all of fourteen years of age. From then on Barry spent all of his time writing songs and playing guitar. Around this time he wrote 'Jenny Of The Sun' and 'Wave Up To The Shore' - which was recorded by Christy in 1976. He did gigs around Ireland, from the Meeting Place (a hot spot for music in the 70s and 80s) in Dublin to McGanns (still one of the best pubs in Ireland for a traditional music session) in Doolin and all places in between, back and forth, up and down the country. In 1977 he toured Germany and England as part of the group Inchiquin, the other members being Noel Hill and Tony Linnane. Micho Russell was also part of this tour and Barry became close to Micho and still calls him a hero. His song 'Hands of a Farmer' is dedicated to Micho. In 1978 he released his first album 'Treaty Stone' which include classic Barry songs. Barry was, and is, always sensitive around issues of injustice and protection of the environment. He participated in the Anti-Nuclear Festivals held in Carnsore Point three years running in 1979. Barry was a finger picking folkie, until the middle of 1979, when tendonitis did serious damage to his picking hand. This caused him to learn to play with a plectrum and change his style of playing. In 1979 Barry moved to Groningen in Holland and was based there for a number of years. He recorded the album 'In Groningen' in 1980. One of the favourite songs on this album is the Felix Pappalardi song 'One Last Cold Kiss'. 1982 saw the release of 'No Heroes' - all of the songs on this album are written by Barry. 'Remember The Brave Ones' was later recorded by Moving Hearts. Barry spent some time playing with Manus Lunny before he headed off in another new direction. 1983-1986 Barry fronted the Dublin post-punk/pop band Red Square. It was one of 5000 bands in Dublin trying to become the next U2. It was great fun. "Got me off the stool, out of the folk clubs, taught me how to roar." In 1984 Barry's son Robbie was born. Robbie has been Barry's inspiration for 'Gabriel' and for singing Mike Scott's 'Sunny Sailor Boy'. Finally in 1987 he made the decision to head to America and check it out! Before he left the shamrock shore he made a serious decision. New country, new people, new everything - why not a new name? Luka Bloom became a possibility - Luka from the Suzanne Vega song 'My name is Luka' and the Bloom from James Joyce's Ulysses. So on the long journey to New York - let the man tell it! - "EI104 the lovely old jumbo that brought me to America in 1987. Window seat: looking down from 35,000 feet at America, repeating quietly to myself, 'Hi, my name is Luka Bloom. I'd like to play here." By the time he landed in New York - LUKA BLOOM - was born! Now begins some serious work. As he says himself: "I made a conscious decision before I went to America to create a solo performance that would be exciting and relevant to rock audiences. I also decided that I was going to create an audience for myself, without the help of record companies." He settled in Washington D.C. initially and set about singing his songs. He trawled the city's clubs for suitable venues, and was ultimately offered a series of weekend gigs in Dylans. He took Monday, Tuesday and Wednesday instead, and so set about drawing an audience who came out because they came out to see him. 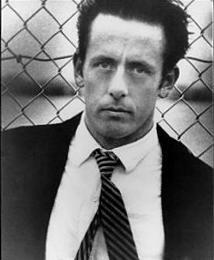 He also did a residency in the Red Lion in Bleecker Street in New York in the winter of 1987. In 1990 Luka recorded the definitive 'Riverside' which features many of his classic songs not least of which is 'The Man Is Alive'. Recorded in New York, many of the songs describe his experiences of New York City as in 'Delirious' or 'Hudson Lady'. 1991 saw Luka back in Dublin to record the next album 'The Acoustic Motorbike'. Luka covered the L.L.Cool J's 'I Need Love' and as the Rolling Stone review put it "the prospect of a folksy Irish rocker covering a rap ballad may seem strange, but experimenting with different forms is precisely what keeps established traditions vital." Indeed - and Luka defied tradition with his version! 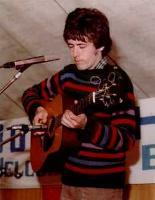 In 1991 Luka appeared at the PinkPop Festival in Landgraaf in the Netherlands. He really caught the audience out when he cycled onstage with his guitar strapped to his back. This is considered the start of his breakthrough in Europe. In November 1992 Luka headed down under for an extensive tour of Australia. He was very well received there as the following review tells: "Luka is a solo performer whose trademark is his thunderous and exhilarating acoustic guitar playing, his fine voice and his warm and passionate delivery. His songs reflect the experiences of so many exiled Irish people who have left for far shores in search of a new life, dreams and love. This is reflected in his song 'Dreams in America'. As he writes there is always the hope of a "reunion in the progress of time"." In 1993 Luka came home to Ireland to record his next batch of songs. Over the year he worked with Ireland's leading producer, Brian Masterson, and with sound engineer Paul Ashe-Browne, to try and capture the atmosphere and essence of his live performance. Using an audience who were begged not to make noise (!) he created the beautiful 'Turf'. "Turf to an Irishman can mean many things. It's something used to fuel fires in the winter, it's a treasured land often left behind. It's taking a stand when your back's against the wall. It's sacred ground that is not meant to be messed with." 'The Fertile Rock' was to become the anthem from 'Turf'. The song is about a campaign to save the magnificent Mullaghmore in the Burren from developers. In February 1993, Luka got a call from the Bottom Line in New York. Lou Reed has requested that Luka joins David Byrne, Roseanne Cash and Lou in a songwriter's night to celebrate the club's birthday. Needless to remark he jumped at the opportunity and had a terrific night gigging with these great artists. 1994 began with a short tour of Holland and then off to America, Canada, Belgium, America, Germany, Switzerland, America and finishing in the Everyman Palace in Cork City in Ireland on 5th December 1994. One busy year! 1995/96/97 saw more of the same with Australia thrown in for good measure in '95 and '96. Luka decided to come home to Ireland and get the feel of the place again. Writing songs, doing some shows, walking in his favourite place, the Burren, basically preparing for new beginnings. He spent some time of 1995 in Birr, Co. Offaly, in a little cottage among the trees between the rivers Camcor and Brosna. Here in the heart of Ireland, he wrote the songs which fill the CD we now know as Salty Heaven. Just as 'I Need Love' could only have emerged from his time in New York, these classic songs could only have come from this landscape he calls home. "But from the achingly reflective opening song 'Blackberry Time through relatively inconsequential tracks like 'Ciara' to the epic, famine-based closing tune, 'Forgiveness', this album will either seduce the hell out of you and take you to, yeah, a tearful heaven or leave you cold. Depends on whether or not you are open to art that is quiet and caressing, rather than screaming to be heard. Not just a wonderful album but an album filled with wonder. And that is a real accomplishment." The launch of 'Salty Heaven' saw Luka embark on another world tour to all the familiar countries again culminating on the 29 of December 1998 in Vicar Street in Dublin. 1999 kicked off in the Red Hot Music Club outside Newbridge in County Kildare and culminated 99 gigs later in the HQ Hall of Fame in Dublin on the 9th of December. In October 2000, Luka released an album of other artist's songs. As he said himself at the time: "I have always believed that it is possible for a solo artist to sing songs from any area and the only limitations are in people's minds. Rather than covering these songs as a novelty, I was determined to convey my love of these songs and the artists who created them." And so 'Keeper Of The Flame' hit the shops. It was very well received. 2001 saw another departure for Luka. He became an independent artist and developed his own website - www.lukabloom.com - it was launched in August 2001. In early 2001 Luka revisited his early work by releasing 'The Barry Moore Years'. This album is a compilation of songs written between 1975-1986. It is only available on his website - www.lukabloom.com. On St. Brigid's Day (February 1) 2002 in both Ireland and the U.S. he released 'Between The Mountain And The Moon'. No doubt Luka had Brigid in mind when he set the release date, as he has always been active in the Feile Bride (St. Brigid Festival) held in Kildare town for the last 10 years. With the patron saint of Kildare on your side, how could you go wrong!! This CD holds a special place in Luka's heart. It is the first album of his own songs that he owns. He took his time with it - writing the songs and recording them over a two-year period. 'Gabriel' and 'Love Is A Place I Dream Of' are two of the favourites on this CD. He again took to the road and toured extensively in Europe, America, Australia over the next six months. Reading Luka's biography in no way conveys the power, energy, atmosphere, downright magic of his live performance. In February 2002 in the beautiful Carre Theatre in Amsterdam, Luka played to a large audience of devoted fans, who had travelled from as far as the West Coast of Clare, Cork, Kildare, Boulder Colorado and Germany to be with the MAN for this concert. It was just brilliant. For over two hours he held us all in the palm of his hand and played his heart out. We hung on his every word and lapped it up. The atmosphere was electric. The audience was singing, laughing, crying, (and even Wolfe was howling!). One man, his guitar and his beautiful music and songs. GO HIONTACH! - AWESOME! Luka's performance is summed in his own words - "Every gig is precious. Whether the Spa in Lisdoonvarna, Carre in Amsterdam, or the Melbourne Concert Hall, the privilege is the same, as is the commitment to the gig." This brings us right up to date. As we write - Luka is preparing for a major European tour in the autumn. Deep down, it's where I come from." In 2003 'Amsterdam' was released - a live performance from a great night in the Carre Theatre in Amsterdam. In 2004 'Before Sleep Comes' was recorded, nine soft songs for insomniacs. Luka spent the ensuing 18 months since launching 'Innocence' in Australia in February 2005, touring constantly in Europe and the US. He then finished the DVD which consists a live show in Dublin, and a small gig in his home filmed that summer. Luka then headed to France to mix his new CD 'Tribe', a collaboration with Dubliner Simon O'Reilly. The album was completely different from anything he has released before. It was released on 14 February 2007. Throughout the remaining months of 2007 Luka worked with two young producers, Niall Rynne and Usna Tunney on The Man Is Alive project. This incorporated filming a live concert in Dublin and another live concert held in Luka�s home. The package also includes a documentary �My Name Is Luka� which was made by a Dutch tv company and a live cd. In 2008 Luka headed down to Grouse Lodge recording studios in County Westmeath to record his latest batch of songs. He was interested in returning to the raw live sound of his earlier records and brimming with his usual enthusiasm set about the work with David Odlum (ex-Kila and ex-The Frames) assisting the production of the now named Eleven Songs. It was launched in early October 2008 and was very well received with four and five star reviews pouring in. Luka has been touring extensively with this latest work, Europe, Australia, United States and closer to home in the UK and Ireland. In heading to America, I also chose to acknowledge the utter newness of this adventure, by taking on a professional name, Luka Bloom. Hey, why not? This is for the songs. Let's see what's out there. It felt like the last throw of the dice. 20 years later I decided to honour those times with a record. It is not a 'best of', with tracks lifted from old records. I chose to revisit songs from the last 10 records since, and bring them back to life with new versions. Sometimes it's a song I don't like the original recorded version anymore; sometimes it's just a new feeling for a song. Sometimes it's the words, sometimes it's the rhythm, and sometimes it's just the sounds on these guitars. This is raw. It's in my livingroom. You can hear the guitarstrap creaking off the wood; the fingers banging off the body. Hopefully you can feel the warmth in the room. It's about the songs, the sound of these strings, and most of all, the words. 2011 was an amazing year, during which I toured Holland with Jan Douwe Kroeske and 2 meters crew; then went to Australia in March. There I was invited to return to Australia in June to sing for the Dalai Lama. By November I realised there were 20 songs needing to be loved. So of course, I began to think about a record. Every singer thinks about a record. These days thinking about a record is interesting, because so many people have lost the love of records, and don't buy them anymore. I still love the feel, the smell and the sound of record, whether vinyl or cd. I don't have a huge collection; but I really care for what I own, because they are part of my life. Anyway, I began to think about these songs, and what to do. Speaking with Brian Masterson, my recording engineer from over 30 years ago, the songs began to grow with each conversation. In the beginning, it would be me and my guitars and a few friends playing. But no, I decided these songs needed more. So I invited some of my heroes, and some of my friends, to come and sing with me, and play with me. Glen Hansard of the Frames and The Swell Season; Rita Connolly, Iarla O'Lionard, Eimear Quinn, who are some of Ireland's greatest singers. Steve Cooney, my guitar hero. A new friend, Dirk Powell from America on Banjo and mandolin. 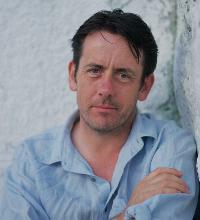 Mairtin O'Connor, who plays accordion and gets deep into the soul of a song. Conor Byrne, my nephew and friend, who's flute tones grace many of my songs. Donal Lunny, an Irish legend, who was one of my childhood heroes with my brother Christy. Robbie Harris, and Samuel Arnold, new friends who played percussion and sang. Frankie Lane, a great dobro and pedal steel player. Caoimhin O'Raghallaigh, a young irishman who is playing a significant part in reviving the true soulfulness of irish music. He played fiddle . And Joe Csibi, my friend who arranged the 16 piece orchestra on 5 tracks. Everybody gave their all, none more than Brian Masterson, who produced the record with me, and mixed and mastered it. I feel blessed. And in the end it is all about the songs. The songs brought us together, and together we try to honour the songs. Making a record is one of the great privileges of my life. It is still in 2012, the only way I want to present my work to people. These songs are really important to me. On this record, these songs were given all the love they needed. No note left unsung, no note left unplayed. Just enough. I am proud of This New Morning, and I thank all who helped bring it to life. It was December 2012. I made the move to the people�s Republic of North Clare in the West of Ireland. Wind and rain howling all around me, it felt apocalyptic and wild, and I loved it. A visitor to Clare since 1973, I never really felt the Winter wind before. In three short years I have come to love this time of warm fires and slow tunes. There is no hurry, because it is down time. Even the Wild Atlantic Way cannot entice big numbers to come. And so we go quiet. We play with and for, each other. This inspired The January Blues. The song FRÚGALISTO I owe to Fergal Smith and all the good people of Moy Hill Community Garden. They are all half my age and they are teaching me about life, as we face into a challenging future for our children and grandchildren. But it is best to just hear the songs, and see what they mean for you. The last song is Wave Up To The Shore. I wrote it in 1971, when I was 16. Pat Colgan was my English teacher then. Pat, and his wife Margaret encouraged me to write songs. I thank them both from the bottom of my heart. It took many false starts, and 44 years to finally record this song. My nephew Gavin sings it with me. Lettercollum House in Timoleague, County Cork gave me the best recording experience of my life I believe. And with the musicians and singers who ventured to West Cork, we took our time, and stepped up to the songs. Some days, Billy the Alsatian sat at my feet when I sang. I just knew everything was fine in this world. And it is.